During George Washington’s presidency, Indian delegates were regular visitors to the seat of government. Washington dined with Cherokees, Chickasaws, Creeks, Kaskaskias, Mahicans, Mohawks, Oneidas, and Senecas; in one week late in 1796, he had dinner with four different groups of Indians on four different days—and on such occasions the most powerful man in the United States followed the customs of his Indian visitors, smoked calumet pipes, exchanged wampum belts, and drank punch with them. Washington knew what history has forgotten: Indian nations still dominated large areas of the North American continent, European nations courted their allegiance, and that the infant United States was still a precarious proposition. 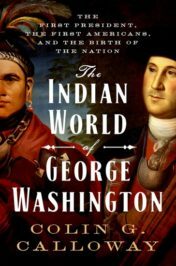 The presence, power, and foreign policies of Indian nations affected Washington’s life at key moments, shaped the course of American history during his lifetime, and posed a major challenge for the young republic and its first president. Washington’s primary goal as president was to secure the future of his young republic and build a nation on Indian land. In that, he succeeded. His second goal—and it was a distant second—was to establish just policies for dealings with Indian peoples. Just months into his presidency, Washington declared that the “The Government of the United States are determined that their Administration of Indian Affairs shall be directed entirely by the great principles of Justice and humanity.” At the same time, Washington’s entire Indian policy and his vision for the nation depended on the acquisition of Indian lands. Washington and his Secretary of War Henry Knox agreed that the most honorable and least expensive way to get Indian land was to purchase it in a fair treaty. The Constitution gave the president treaty making authority and required that treaties be ratified by 2/3 majority vote in the Senate. Washington told the Senate that that included Indian treaties as well. Once ratified, Indian treaties became the law of the land. Offering tribes a fair price for their land and extending to them the benefits of American civilization, Washington hoped, would allow the United States to expand with minimal bloodshed and at the same time treat Indian peoples with justice. But if, as they often did, Indians refused the offer, the politicians felt there was no choice but to wage war against them. During the Revolution, Washington sent armies into Iroquois country that resulted in forty burned towns, orchards cut down, and 1600,000 bushels of corn destroyed. In this, as in so much else, the first president set precedent. The father of the country was also, in many ways, the father of America’s tortuous, conflicted, and often hypocritical Indian policies. After he dispatched armies to ravage their country during the Revolution, the Haudenosaunee or Iroquois called him “Town Destroyer.” In 1792, six months after returning from treaty negotiations in Philadelphia, the Cherokee chief Bloody Fellow declared “Congress are Liars [and] general Washington is a Liar.” Yet Washington also offered what he saw as a path to a better future for Indian people who made peace and adopted American ways of living, and many Cherokees followed that path. Looking back from the 1820s and ‘30s when the United States was riding roughshod over its treaties in a rush to relocate eastern Indian peoples west of the Mississippi, the Cherokee chief John Ross remembered with reverence the first president who had dealt justly with Indian nations; he named his son George Washington. Washington aspired to a national Indian policy that might somehow reconcile taking Native resources with respecting Native rights even as the nation expanded across Indian homelands and ignored Indian treaty rights. In that, of course, he failed, and his failure has been America’s failure. In the end, Washington’s story in Indian country became an imperial narrative; it could hardly have been otherwise given the goals he set and the forces he helped set in motion. Assaults on Native resources and rights have continued from Washington’s day until today, but not all subsequent presidents have struggled as he did with the inherent contradictions of the nation’s Indian policies. Featured image credit: “The life of George Washington (1848) (14754656546)” by Internet Archive Book Images. Public domain via Wikimedia Commons. Colin G. Calloway is John Kimball Jr. 1943 Professor of History and Native American Studies at Dartmouth College. He is the author of A Scratch of the Pen, The Victory with No Name, and most recently The Indian World of George Washington. This blog is fake history. You are relying on the fact that most people do not know early history. My sources: To Do Good to My Indian Brethren Laura J Murray and a Time of Terror by AJ Berry. General Haldimand, British commander in Canada, fought against General Washington in the Mohawk Valley (Iroquois land). General Haldimand’s plan was to drive the Palatine settlers out of the Mohawk Valley and to destroy the crops in the Mohawk Valley that fed General Washington’s troops. The Palatine settlers and most of the Iroquois lived peacefully as neighbors before the Revolutionary War. General Washington had meetings to request neutrality from the Indians. At first the Indians remained neutral but the British in Canada under Haldimand’s command offered the Indian tribes 20.00 for each scalp (children’s, women’s, men’s). The ability to make material gain on killing drove all tribes, but the Christian Iroquois Indians, to side with the British. The devastation to human life caused by Britian’s desire to win the war was brutal in the Mohawk Valley. Haldimand’s offensives were destroying farms and homes and killing farmers and their families. Thank goodness that the French advised the farmers to build forts that protected their families. It is after the war that land became a factor. It was the inability to forgive the brutal killings that led to the Iroquois being driven off their land. Greed for land always follows, no matter what side. Unfortunately the support of the Christian Iroquois Indians (Brothertown Indians and Oneidas) was forgotten. We are forever in their debt. You, who write for Dartmouth, should know this. Dartmouth was created by funds for the Brothertown Indians (Sampson Occum). I just wanted to let the good folks at Oxford University Press know that Prof. Calloway’s newest book (The Indian World of George Washington) was not being sold at the Davenport, Iowa Barnes & Noble or Books-A-Million retail outlets. I questioned a sales person at Barnes & Noble about the wisdom of not having such a relevant book in stock and was told “Well, we can’t have everything.” After a brief discourse by me about the relevance of a new work about Native American history and George Washington by an author of Prof. Calloway’s repute, the salesperson huffily stated that one (one!) would be ordered. I took my business to Amazon and my copy arrived today, which I now greatly look forward to reading. As to the above comment about Prof. Calloway’s blog being “fake history,” I am surprised that comments so lacking in civility have migrated from the political landscape to the academic sphere of this website. History is complicated and messy, and there are as many competing truths as there are participants, and they are not mutually exclusive of each other. Like the Bible, history and its multitudinous scribes have put forth enough conflicting interpretations of the past to support virtually any case for or against its participants.